I have really been loving the little brown oxford trend in London. I’ve been wanting to get a pair for myself because it’s so easy to make any outfit look classier by adding stylish oxfords. I am always keen to support small creative businesses, so I took a look on Etsy for something to fill the void in my closet. Low and behold I found this fab shoe shop in Greece, called TheDrifterLeather. When you order them from their Etsy shop, they ask for your shoe size, but you also send them your actual feet measurements. They custom make each pair, so they can tweak them to fit you perfectly! I have never had a custom-made pair of shoes so this all feels so decadent, and yet, they are so affordable. I cannot wait to get these! 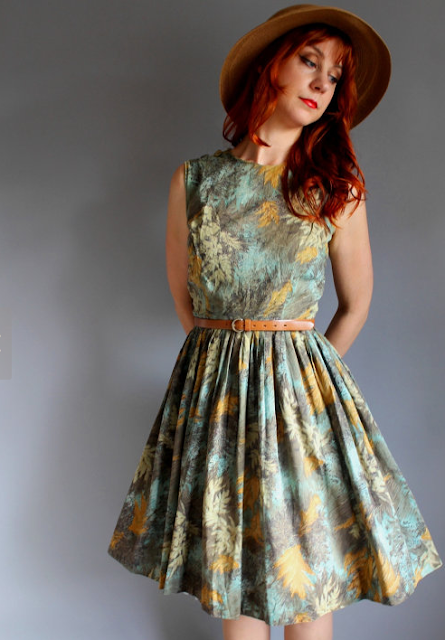 My friend, Lauren, would look amazing in this vintage, cotton dress I found on Etsy today. From the shop GoGoVintage in the USGoGo Vintage.